This fantasy knife is like no other, and now it can be yours! 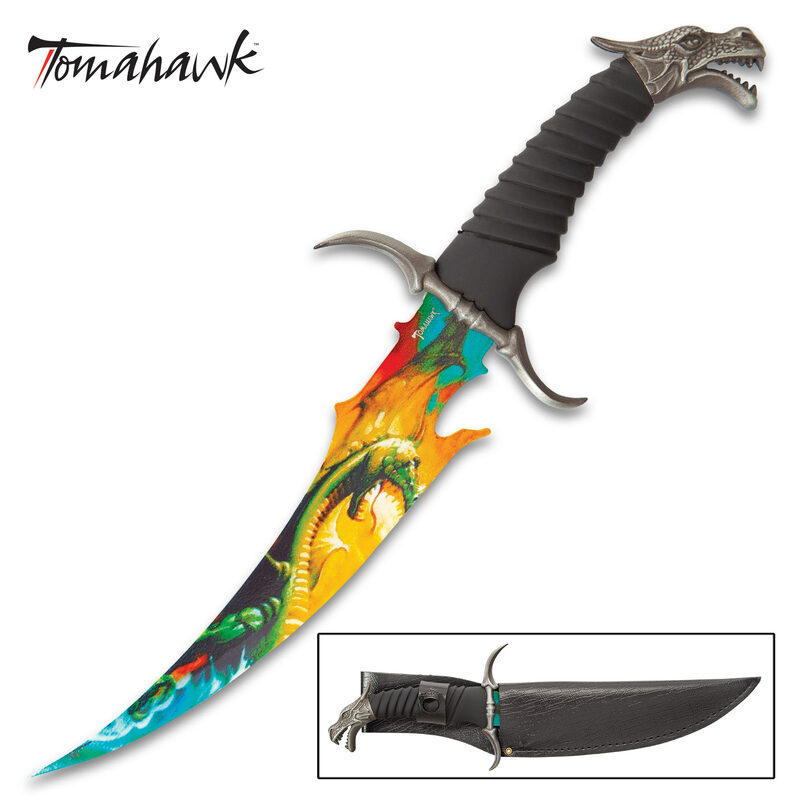 The Fantasy Dragon Bowie features a wicked stainless steel 8" blade with full color dragon artwork to give it the most distinctive look on the market. The grip offers a cast metal guard and pommel that accent the blade and add to this piece"s overall look and feel. This item measures 12 1/2" overall. Just got this Bowie, and was a little disappointed, it's a beautiful piece but has a ceramic blade and the dragon handle is plastic. First knife I've gotten from true swords Iwasn't completely happy with. Will still buy from them. Not what I was expecting, the knife was not sharp. It was a good design I will not order any knives that does not say sharp blade. I called customer service they told me to use the label that was with the invoice to ship it back with. Took it to UPS and they charged me $16.45 to send it back which is a whole lot more than I paid for the knife. I will not ever send a knife back I will just chalk it up as a loss. It's a cool design but totally NOT what I was expecting. It's not a knife or a dagger it's just like a plastic design "Knife" it's really only for design but good for nothing else. Beautiful pc. I have it on display . it is a eye catcher.Love the way it looks . Anybody that collects knifes this is a must have. Very happy the way its looks with my other knives on display. Like the other review said, it's a great looking knife, just not sharp like a knife. The blade is dull and point isn't "pointy", but other than that I really like the dragon handle and the colorful art. I would recommend if you don't mind it not being as sharp as you think it will be. A pretty piece but not really a knife. By that I mean the blade has no edge at all on it. I thought it was made of resin at first but a magnet sticks to it. I guess it would make an acceptable butter knife, but a wall decoration is all this "dagger" amounts to. The blade is very thin and the "edge" is flat. I guess you could sharpen it, but you would grind off part of the painted design. I recommend this dagger for show only. I just got it TODAY :) Its a Beautiful piece but i was a bit disappointed With the blade it was ceramic .. and if it falls its done.. This will be the Greatest Xmas Ever!! !